The External Single Chamber Pacemaker PACE 101H provides reliable and effective temporary stimulation wherever it is required. 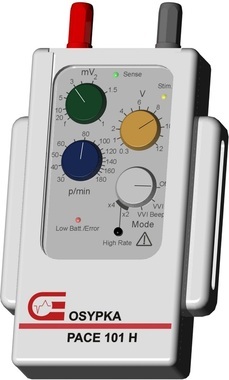 Dot Medical offers a range of External Pacemakers from Osypka for every kind of temporary cardiac stimulation environment. Triple Chamber when Cardiac Resynchronisation is important, Dual Chamber for standard post Cardiac Surgery and TAVI procedures, and Single Chamber for quick and easy simple pacing. Click on this button to connect with the Osypka Manufacturer website.